Theodore B. Travers Family Veterinary Clinic, Oakland, awarded highest level of veterinary hospital excellence on all counts. The East Bay SPCA announced today that the Theodore B. Travers Family Veterinary Clinic has achieved the highest level of recognition of veterinary excellence following a thorough evaluation from the American Animal Hospital Association (AHAA). Only the top facilities in the U.S. and Canada can achieve accreditation. The accreditation process is optional for veterinary hospitals, which unlike human hospitals are not required to be accredited. Currently, only 12 percent of all veterinary clinics are accredited and only five in the Bay Area that are associated with an animal shelter. The Theodore B. Travers Family Veterinary Clinic of the East Bay SPCA is located at 8323 Baldwin Street, Oakland, CA 94621. The newly renovated, state-of-the-art facility opened in August of 2013, replacing an outdated 1950’s-era facility. In 2013, more than 7,000 cats and dogs were seen by the clinic’s veterinarians and nearly 9,000 surgeries were performed. The clinic is open Monday through Saturday by appointment only. Please call (510) 569-1606 to schedule an appointment. 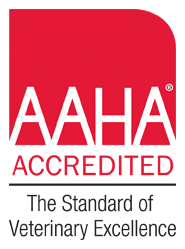 For more information about AHAA, please visit http://www.healthypet.com. The East Bay SPCA is a 501(c)3 nonprofit committed to the welfare of cats and dogs in Alameda and Contra Costa Counties. Established in 1874, the East Bay SPCA is one of the nation’s oldest independent humane organizations and receives no funding from local, state or federal governments, or any national animal welfare organization. We strive to eliminate animal cruelty, neglect and overpopulation by providing programs and education that support people and companion animals. In Oakland and Dublin, we offer adoption centers, spay/neuter surgery centers and dog training classes. The AHAA accredited, full-service Theodore B. Travers Family Veterinary Clinic, is located on the Oakland campus of the East Bay SPCA. For more information visit eastbayspca.org, or like us on Facebook.